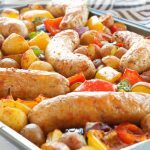 This Italian Sausage Sheet Pan Dinner is the ultimate easy meal recipe for a quick weeknight dinner! It's bursting with delicious Italian flavours and it's on your dinner table in 30-minutes or less with hardly any clean-up! Preheat your oven to 425 degrees Fahrenheit and spray a large baking sheet with some cooking spray. Add the sausages, red onion chunks, baby potatoes, bell pepper chunks, and zucchini slices to the greased baking sheet. Sprinkle the smoked paprika, the oregano and the salt and pepper over everything and toss well. Arrange the sausages evenly on the baking sheet and nestle them into the vegetables. Roast everything at 425 degrees Fahrenheit for about 20-25 minutes, or until the sausages are cooked through completely and the baby potatoes are soft. Use a meat thermometer to ensure the sausages have reached an internal temperature of at least 165 degrees Fahrenheit. Garnish with some fresh cilantro or parsley and serve this meal to your hungry family!